The Freeware edition of Advanced Installer does not need registering. The Professional, For Java, Enterprise and Architect cannot be used outside the trial period without a valid registration in place. You can register your copy of Advanced Installer from the File > Help > Register menu. 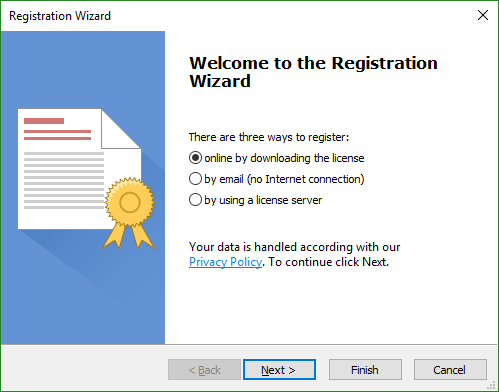 The registration process requires a valid License Key which you receive when you purchase Advanced Installer. A working internet connection is required. Advanced Installer will connect to our license server and will download the license file to your computer. A dialog box will display your Computer ID. Send it to us from any machine with Internet access, in an email addressed to support at advancedinstaller dot com, along with your License Key. You will receive in return an email containing your license file and further instructions. Please check your junk folder, spam filter rules, and white-list our email address if you don't receive our reply in 48h. In order to register Advanced Installer using this option, a floating license must be purchased. The License Server must be correctly installed and configured by your network administrator. You need to know the server's host name and port number. How to configure the Advanced Installer License Server.